Iceland is one of the most diverse and beautiful countries in the North Atlantic Ocean and is, without a doubt, one of the best places to go waterfall exploring. There are an astounding 10,000 waterfalls gushing over craggy mountainous rocks throughout the land. At some, you can stand atop, gaze across at the breathtaking view and appreciate the sheer power of the water. Others will allow you past their watery curtain into the secret cave-world behind. With over 10,000 waterfalls to choose from, you could spend weeks, months and even years visiting them all. So, we’ve pulled together the list of the top 14 unmissable, best waterfalls in Iceland, just for you. Get your camera ready and book your Iceland trip today. The 20 meter (65.6ft) tall Aldeyjarfoss waterfall captures vast frothing water as it tumbles through the narrow black basalt passage into the circular basin below. The unique black basalt columns makes this one of our favourite waterfalls in Iceland. Ideal photo spot: The West bank entrance is less touristy than the East. Stand across from the waterfall for a symmetrical shot. – Part of the route is a designated ‘F’ track and 2WD cars are not allowed to access. If you don’t want rent a car with 4WD you can take an organized tour. – A designated car park, is 10-15 minute walk to the waterfall site. – Be mindful of the farmland and animals when driving. – Bardardalur – This remote but spacious self-contained holiday home sleeps up to four guests and is only 5.7 miles (9km) from the waterfall site. – The Kidagil Guesthouse – A private bedroom offered in a bed and breakfast-style accommodation with comfortable rooms and a communal lounge. This majestic 60 metre (196ft) wide waterfall domineers the rugged landscape and is the largest waterfall site in the Westfjords. The Dynjandi (also known as Fjallfoss) is actually a series of seven beautiful waterfalls which have a cumulative height of 100 meters (330ft). The term ‘dynjandi’ actually means ‘thunderous’, and this powerful waterfall demands respect, awe and silence. Ideal photo spot: Stand at the bottom of the waterfall and shoot upwards with a wide angle lens. – The road to the waterfall is steep and challenging in a car so use a low gear when coming down the hill to give more control. – It is a 15 minute walk on a rocky, medium-challenge path to the Dynjandi. – Stop by the many smaller waterfalls on the pathway to Dynjandi, each are marked. – The three star Hotel Isafjördur offers relaxing and good value for money bedrooms with an onsite restaurant. As one of the smallest waterfalls on our list, just 3 metres (9.8ft) tall, you may want to disregard a visit, but let us stop you right there. Known as Iceland’s bluest waterfall we won’t judge you for thinking that you’ve passed into a fairytale once you find this hidden gem. Ideal photo spot: Take a panoramic shot from crouching down on the bridge that crosses the waterfall. – Although a 4×4 car is not required, the gravel roads are difficult. – The exact location can be difficult to find so print directions beforehand. – From Reykjavik take Route 1 (North), pass Mosfellsbaer and take Route 36 toward Pingvellir. At Gjábakkavegur Route 36 will turn into Route 365 by branching left. Continue along Route 365 and follow signs for Laugarvatn. Then, at 10 miles (16.3km) after Laugarvatn you’ll see a small sign on the left which reads “Brekkuskogur”, turn left onto this road and look for a red gate on the left-hand side. You can park anywhere near here and continue the rest on foot. Be careful, if you end up in Veidilundur then you missed the Route 365. Accommodation Tips: Litli Geysir Hotel offers a small and cozy nights accommodation with onsite restaurant. Falling from a height of 12 meters (39ft) and with a width of 30 meters (98ft) Godafoss is one of the most spectacular waterfalls in Iceland. This mystifyingly elegant waterfall is semicircular in shape and glides over the landscape smoothly. Ideal photo spot: From the East side stand on the craggy edge and take a high angle shot. From the West side, be careful climbing down to the rocky ‘beach’ area, you can capture a great low angle shot. – The East side has a cafe and guesthouses nearby; the most-popular West side is near to parking but has a difficult pathway. – Fossholl Guesthouse is just a short walk to the waterfall. It offers basic but comfortable accommodations with traditional Icelandic food served onsite. Although only 5 meters (16ft) tall the stunning glacial background of these mountains is what makes this three-spouted waterfall a special sight. If you’re lucky, head to the waterfall on a dark winter night and you might be treated to the delights of the Northern Lights playing overhead. Ideal photo spot: Stand on the far side of the main road, with the lake in the foreground and mountain in the background you can see the beautiful waterfall glistening in the reflection on the lake. – The car park is five minutes walk to the waterfall. Follow the trail over the bridge from the car park and then you can carefully walk down to the slippery lower levels of the waterfall. – Kirkjufellsfoss is a popular attraction so expect other visitors. – H5 Apartments, an excellent self-sufficient base with stunning views. Flowing at 128 metres (419ft) Hengifoss is one of the highest waterfalls in Iceland. The majestic water flows from the top of a gorge into the colourful basin below, it’s water reflecting flashes of colours from the rocks below. Ideal photo spot: On a low-close level, take advantage and shoot upwards to capture the colours. – The car park, which has toilets, is a 2.5km hike away. – A number of GPS-based hiking trails around nearby which can be found online. – Kaldá Lyngholt Holiday Homes with a well-equipped kitchenette and guest access to the onsite sauna and hot tub. – Mjóanes Accommodation offers a unique stay with stunning design features. – Stormur Cottages are wooden and basic but extremely comfortable. Reputed to be the most powerful waterfall in Europe, this roaring beast is a must-see on any trip to Iceland. Dettifoss stands proud at 45 meters (147ft) high and an incredible 100 meters (328ft) wide, you’ll need to stand back in order to truly take in all of its splendor. Ideal photo spot: From the West side you can capture the width. From the East side you can more easily see the height. – For the East bank follow road 864, for the West bank follow the 862. – West Bank is less touristy. – East Bank includes slippery stairs. – Dettifoss Guesthouse is highly recommended for its simple but modern rooms. This is an unusual but entirely natural phenomenon as crystal clear spring water flows through lava and run-offs as hundreds of tiny, interconnecting waterfalls measuring over 900 metres (2952ft) wide. The lava has been created over many years by a volcano lying in wait under the Langjokull glacier, and as the water flows over its blackened rocks the water will magically turn from bright turquoise to a soft milky white. Ideal photo spot: Take an extra-long lens and focus on achieving ideal close-ups. – An ideal day trip from Reykjavik. – Easy terrain to the waterfall site, there are pay-to-use toilets near the car park. – During summer months there is a coffee shop. – Hótel Húsafell, contemporary hotel comes with golf course, outdoor hot tubs and restaurant. – Harpa Holiday Home, a wooden cabin with kitchen, outdoor hot tub and terrace area. Known as ‘Black Falls’ this Waterfall gets it name as water falls 20 metres (80ft) over the cliff edge and is flanked either side by tall black basalt columns which stand proud. This truly is a fairytale photo moment and one that simply cannot be missed whatever the season. Ideal photo spot: Use the river stones as platforms to carefully reach the far-side for the best angle. Or, use a wide-angled upfront shot with a fast shutter speed. – Be prepared, some of the hikes are long and difficult. – Hotel Skaftafell has breathtaking views of the glacier, excellent À la carte dining and spacious private rooms. – Fosshotel Glacier Lagoon, boutique hotel with views of Vatnajökull National Park. 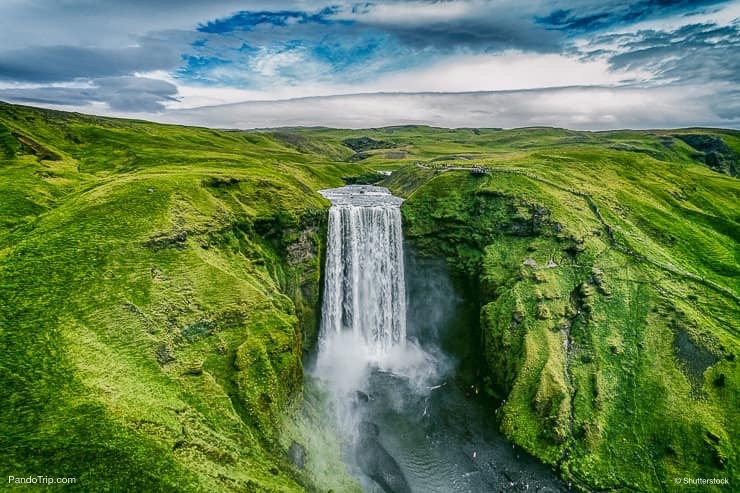 Listed at 122 meters tall, this is one of the highest waterfalls in Iceland, but due to its location off-the-beaten-track it doesn’t get many visitors. You can enjoy your own personal visit in serene silence, listening only to the sounds of the crashing water below you. Ideal photo spot: Position the waterfall in the forefront right handside to see the full landscape. Take ND filters if you have them. – The best time to visit July-August, for access the rest of the year, check the road status. – Use a 4×4 car for the last 4 miles (6.5km) of gravel road. If you don’t have a 4×4, park the car at the gravel road and hike the remaining 2 hours. – Be careful of the high cliffs. – Hagi Homestay, home away from home-style accommodation. This unique waterfall is part of the Skoga River, on what was once the cliff of the former coastline and even featured in the blockbuster film ‘Walter Mitty.’ It is squeezed in between two cliffs, take stairs down to the water-level and take in the surround sound of the tumbling water. Ideal photo spot: During sunrise, on the Eastern side catch the glistening water with an upward shot. If you’re lucky on a sunny-misty day, you can capture a rainbow across the waterfall. – Easily accessible and only a short, flat walk from the car park. – There are 500 stairs on the Eastern side leading down to the base. – Very touristic, expect other guests. – Hótel Skógafoss with views of the Eyjafjallajökull glacier. – The Garage, a spacious and bright apartment unit with terrace and kitchenette. Another one of Iceland’s highest waterfalls, Glymur measures in at 198 meters (649ft). The area around the waterfall is very luscious, to reach the top you’ll traverse over hidden pathways, through caves and eventually come face to face to the unnerving waterfall as it plummets over the drop. Ideal photo spot: The best views are from either the top of the waterfall or from the viewing area on the south side of the river. – The hike, which takes 3 – 3.5 hours, is steep and difficult so be prepared. – Hotel Glymur offers relaxing rooms with good amenities including a restaurant and hot tub. Ever wondered what secrets are hidden behind those watery curtains, well at Seljalandsfoss, in the Summer months you can explore behind this special waterfall. The gentle water falls slowly over the 60 meter (197ft) drop to the basin below and it is a very peaceful place. Ideal photo spot: Behind the waterfall, but take note of your ISO or use a flash to avoid looking ghostly pale. – Follow the Seljalandsfoss Hike for the 15 minute walk behind the waterfall. Be careful as it is not flat and is slippery. – Visit early in the morning or at sunset to avoid tourist crowds. – Brú Guesthouse has numerous units with kitchenettes and terraces with mountain views. – Nice Hostel Seljaland has many different room types and has a buffet breakfast. A traditional 32m high (104ft) two-tiered waterfall that freezes over in the watermonths to create waves of crushing ice. In the Summer thousands of tiny rainbows can been seen playing across the misty waters. Ideal photo spot: At the lower section you can take a pretty picture of the rapids, whilst higher nearer the top you can capture the power of this waterfall. – Hotel Gullfoss is nearby and features a restaurant with traditional Icelandic meals. From trickling, peaceful waterfalls to gushing rapids that demand respect you can find them all in Iceland. So, choose your waterfall itinerary from our list, book your flights and start exploring this precious and awe-inspiring land today.